The Panthers saw five key players decide to play high-school ball rather than for elite academy teams. Prep went undefeated in the regular season and are contenders for the Class 3A state title. 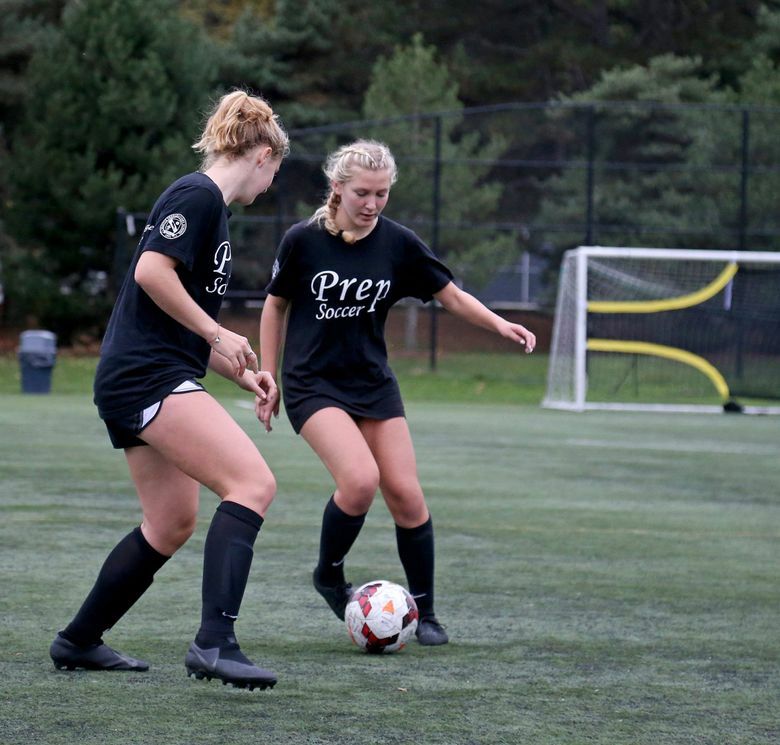 Aspiring to be part of something bigger is how Seattle Prep girls soccer players describe the program. The Panthers are enjoying another banner season on the soccer pitch, and it’s for many reasons, including the lure of playing with friends and representing the school and community. The strength of the Seattle Prep roster was bolstered this fall when five players stayed committed to or returned to high school from the academy soccer experience. Academy teams prohibit high-school players from playing for both their schools and club, and several chose their school colors instead. The results show after the Panthers enjoyed an 18-0-0 regular season, winning the Metro League Mountain Division title (10-0-0). Seattle Prep enters state 18-1-0 after falling 2-1 to Lakeside on Thursday in the Metro League title match. Senior forward Helena Reischling, who committed to the University of Washington before her sophomore year, played last season for Crossfire Premier’s Development Academy U-17 team. She turned down playing this season in favor of the high-school experience she enjoyed as a freshman and sophomore. For senior Bea Franklin, who is committed to play for Notre Dame, the love of high-school soccer never tempted her toward the Academy route. Franklin was asked to play for Crossfire’s Academy team before her junior year and turned it down. Junior defender Olivia McAuslan opted to leave Seattle Reign Academy and come back to Prep after one season. Senior midfielder Mackenzie Floyd returned after a season with Crossfire Academy. Prep is making its 10th consecutive state appearance and 18th trip in 19 seasons. Freshman Jayce Woodward, whose sister, Jalen, was a senior on the 2015 state-championship team, stopped playing for Seattle Reign after being part of their program at age 12 and 13. Reischling and Franklin opened their high-school career with that 2015 title. Capping it would be a dream finish. When: First round Tuesday and Wednesday; concludes with finals on Nov. 17. Where: Early rounds at various home sites around the state. Class 4A and 3A semifinals and finals at Sparks Stadium in Puyallup; 2A/1A semis and finals at Shoreline Stadium; 2B/1B boys and girls at Sunset Chev Stadium in Sumner. Follow along: On Twitter, @TimesPrepsMattM; @WIAAWA. Top storylines: Issaquah (11-1-2) brought home the school’s fifth state title in girls soccer last fall under retiring coach Tom Bunnell and the Eagles are poised for another state-title run under new coach Kyle Tatro, who doubles as the boys coach in the spring. Issaquah’s lone loss this season was to unbeaten Mercer Island 1-0 on Oct. 9. … Defending Class 3A state champion Mercer Island (16-0-1) enters state with 13 shutouts, and the Islanders appear poised for a repeat title run. … 3A Seattle Prep (18-1-0) and 4A Jackson (16-1-1) were two of the last unbeatens to fall and enter state coming off rare losses. … Selah (18-0-0) must be considered as the favorite to win the 2A crown. Five players to watch: F Maddie Kemp, Camas, Sr. (48 goals, 13 assists); MF/F Kaylee Coatney, Bonney Lake, Jr. (20 goals, 19 assists); D/F Bea Franklin, Seattle Prep, Sr. (11 goals, 5 assists); MF Helena Reischling, Seattle Prep, Sr. (14 goals, 18 assists); F Moira MacKay, Burlington, Jr. (32 goals, 11 assists). Favorites: Girls 4A: Issaquah (defending champs), Puyallup, Central Valley (Spokane Valley), Gonzaga Prep, Camas (2016 champs). Girls 3A: Mercer Island (defending champs), Gig Harbor, Kamiakin (Kennewick), Stadium (Tacoma), Seattle Prep. Girls 2A: Liberty (Issaquah) (defending champs), White River, Lindbergh, Fife, Hockinson, Columbia River, Selah, East Valley (Spokane). Girls 1A: King’s (defending champs), Cascade (Leavenworth), Lakeside-Nine Mile Falls, Deer Park, Klahowya, LaSalle. Girls 1B/2B: Adna, Liberty Bell, Friday Harbor. Boys 1B/2B: Evergreen Lutheran, Orcas Island, Kalama, Prescott. Last: Has there been a more dominant team in any classification than Class 3A Gig Harbor (19-0-0)? Not only did the Tides win the South Sound Conference, they enter state having outscored opponents 91-5.